According to The Pulse Of Radio, three original SMASHING PUMPKINS members were photographed together in the studio on Tuesday (January 16). Founder and frontman Billy Corgan and drummer Jimmy Chamberlin were joined at a Los Angeles recording studio by original guitarist James Iha, prompting Corgan to write on Instagram: "@smashingpumpkins: Not sure what cross-eyed spy took this photo, but we had a visitor to the studio the other day. So many memories when you put the three of us together. @jamesihaofficial @chamberdrums #WPC." Corgan also wrote: "Life is wonderful. Keep moving. I could complain (because there are always irritants to the rainbow in my mind) but ’tis more graceful to stay inspired. To see all as being in it’s perfect place.. #beherenow." Iha joined Corgan, Chamberlin and the rest of the current PUMPKINS lineup for three performances in the spring of 2016. Since then, Corgan has also mended ties with long-estranged bassist D'Arcy Wretzky and spoken openly about the possibility of a reunion tour. Corgan discussed the chances of the original quartet playing live together again last year, saying: "[A reunion tour] has been knocked about... But I'll say this and I mean it: If we never play a note together again, that's okay. I'm way, way more interested in the fact that we have peace with each other." Corgan and Chamberlin have been in the studio recently working on a song called "Route 666", but it's unclear if that is intended as a PUMPKINS track or something else. 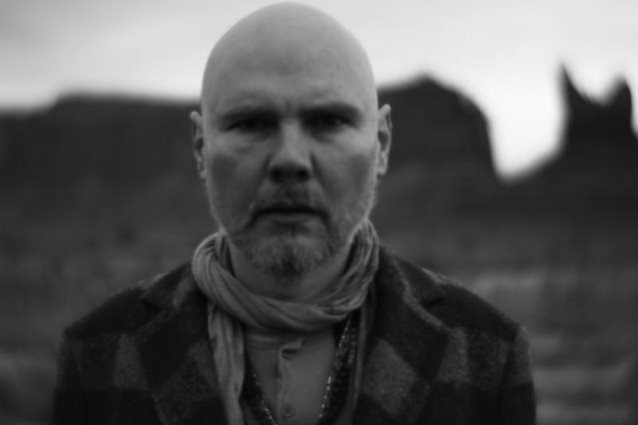 Corgan released a solo album last year called "Ogilala" and claims to have more new music on the way in 2018, while the rumors of a full-blown PUMPKINS reunion continue to percolate.